Like a lot of other people, I get overwhelmed thinking about what to take to work for lunch if there aren’t any handy dinner leftovers. It feels so much easier to grab a microwave meal or make a sandwich or eat out. So I got in the habit of making lunch for the week on Sundays. These are my go-to meals for making lunch prep a breeze! Most of us have seen those “salad in a jar” posts, where you layer salad ingredients in a jar and then shake it up right before you want to eat it. This is just like that, but with tupperware containers. I think the containers work better because I don’t want to travel around with glass jars, I don’t want to eat out of one, I can fit more things into a container and I can safely microwave the container for 5 seconds to take the chill off when it comes out of the fridge. What you do here is layer your salad from wettest to driest ingredients. A typical one for me starts with a little raspberry balsamic vinaigrette on the bottom, then some cubed smoked chicken, then sliced cucumber, then shredded cheddar cheese, and topped with lettuce. When I’m ready to eat, I turn it upside down and vigorously shake it with the lid on so the dressing goes all through the mixture. Turn it back over, take off the lid and enjoy! I can quickly make 10 of these containers for my husband and I to just grab out of the fridge before rushing off to work. Buy cooked vegetables from the freezer section or canned section of your supermarket. Check the labels to make sure there aren’t any ingredients you want to avoid. If your vegetables are frozen, simply let them defrost on the counter. In meantime, season some chicken tenders and cook on each side for about 5 minutes, until cooked through. Then just start your assembly, adding a few chicken tenders and some defrosted or canned vegetables to each container. I give everything a quick sprinkle of salt and pepper and pack it a way in the fridge. Easy peasy. A favorite of mine is seasoning chicken tenders with Trader Joe’s 21 Season Salute and pairing it with their grilled zucchini and eggplant. Grab a pack of 100% beef burgers from your freezer section and toss them in the oven. If you have time to spare, you could mix up your own fresh burgers and bake them like I did in the Oven-Baked Salty Onion Burger recipe. When they’re done, put a couple in a container and top with a slice of cheese, a slice of tomato, pickles and an onion. You can add ketchup right to the top or take along some ketchup packets to squeeze on later. Because there’s no bun, everything heats up later in the microwave really well. I eat this with a knife and fork. These are perfect if you don’t have access to a microwave at work, you routinely have to eat on the run or you prefer to snack all day instead of eating at a set time. All it takes is a nonstick skillet, cooking spray, tortillas and whatever filling you enjoy. I spray the skillet with oil, lay down a low carb tortilla, add chicken, shredded cheddar and chili powder, top with the remaining tortilla and brown on each side on medium heat for 4 minutes, until cheese is melted. Remove from the skillet and cut into wedges. I wrap these in foil and keep them in the fridge. They are so good cold for just munching at your desk. Some of the most popular pictures on my Instagram account are the pictures I take of my antipasto plates. This is another one that requires no reheating. As a matter of fact, it involves no cooking at all! Just meats, cheese and a side. I typically do an italian version with salami, prosciutto, provolone (hard cheese), fresh mozzarella (soft cheese), olives and a sprinkle of black pepper. But you don’t have to stick to the traditional! I’ve made other versions with ham, turkey, cheddar, smoked gouda and pickles. Go Greek with sliced chicken, chunks of feta, pepperoncini, a dusting of oregano and a drizzle of olive oil. I hope you’ve found this helpful! 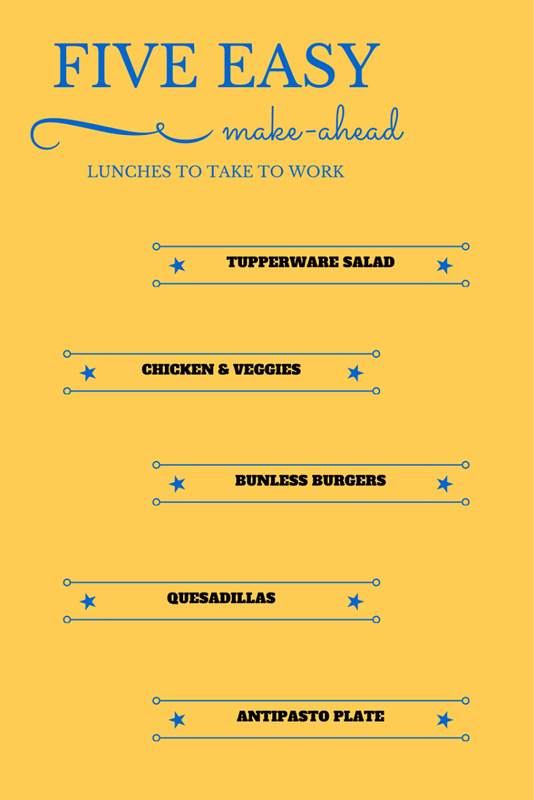 What are some other lunches I should add to my repertoire? I love this list! It’s so helpful when you’re stuck in a lunch rut. I’ve been looking for ideas for my daughter’s lunch, so this is very timely. I can’t believe I never thought of layering the salad in a Tupperware container instead of a jar! Ooo, low carb tortillas? Where might I find those? I miss quesadillas!!! I actually have a bunless burger in my lunch for tomorrow. I never ate my burgers with a bun so I haven’t missed them since going LC. Trader Joe’s has some. Also, in most grocery stores Mission Brand has an awesome version!! http://www.missionmenus.com/en/products/view/carb-balance-flour-tortilla If you cannot find either of them, look into recipes for Oopsie bread or making bread with almond butter or cheese. I am just now seeing recipes for bagels (aaah!!!!) made without carbs. Can you believe it?! You can seriously find/make everything you want without sacrifice these days.